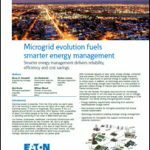 Microgrid Knowledge is committed to safeguarding the information Users entrust to Microgrid Knowledge and believes every user should know how Microgrid Knowledge utilizes the information collected. Microgrid Knowledge may collect personally identifiable information (including demographic and biographic information) from Users in a variety of ways, such as when you register for a newsletter, white paper, webinar, RSS Feeds or events. Microgrid Knowledge may also collect information about how users use our Website, for example, by tracking the number of pages viewed. We may use “cookies” to track how users use our website. A cookie is a piece of software that a web server can store on the users’ PC to identify the user should they visit the web site again. While not all of the information that we collect from users is personally identifiable, it may be associated with personally identifiable information that users provide us through our website. We currently use third party ad software to serve ads on our site. The cookies received with banner ads served by this software are used to collect and build anonymous behavioral profiles by these companies to deliver targeted ads and tracking referrals. Microgrid Knowledge and its trusted business partners may use personally identifiable information collected through the website to contact users regarding relevant products and services, and otherwise to enhance the users’ experience. Microgrid Knowledge may also use information collected through our website for research regarding the effectiveness of the website, advertising and sales efforts of Microgrid Knowledge , its trusted business partners. Microgrid Knowledge may disclose information collected from Users to trusted affiliates, independent contractors and business partners who will use the information for the purposes outlined above. Finally, we may transfer information collected from Users in connection with a sale of Microgrid Knowledge’s business. Microgrid Knowledge reserves the right to disclose personally identifying information if we have a good-faith belief that the disclosure is reasonably necessary (a) to satisfy applicable law, regulation, legal process, or enforceable governmental request, (b) to address fraud or security issues, or (c) to protect against harm to the rights, property, or safety of the Publisher, or our employees or customers. It is important that we keep only the most accurate, up-to-date information about you in our records. Therefore, if you believe that our records contain information that needs to be updated, you can email us at kevin@energyefficiencymarkets.com to correct or update your contact information. You may also email us at kevin@energyefficiencymarkets.com to remove your name, telephone, postal and email addresses from lists that we maintain for purposes of sending out notices or updates, or to request that we refrain from disclosing your personally-identifiable information to third parties. Microgrid Knowledge uses advanced ad serving technology to offer interest-based advertising. This platform uses unique cookies to identify and collect data such as web browser type, browsing habits etc. and to store that data for advertising purposes. The data we collect with this targeting is considered non-personally identifiable information. This data is information that cannot be used to identify, contact or locate a particular individual or entity. We use this data in order to deliver you more relevant advertising and to enhance your experience.